Holy smokes- its September. I actually have no idea where my summer went. But September means a lot of great things: kids are back in school, fall foliage, peach season and most importantly…Football season! 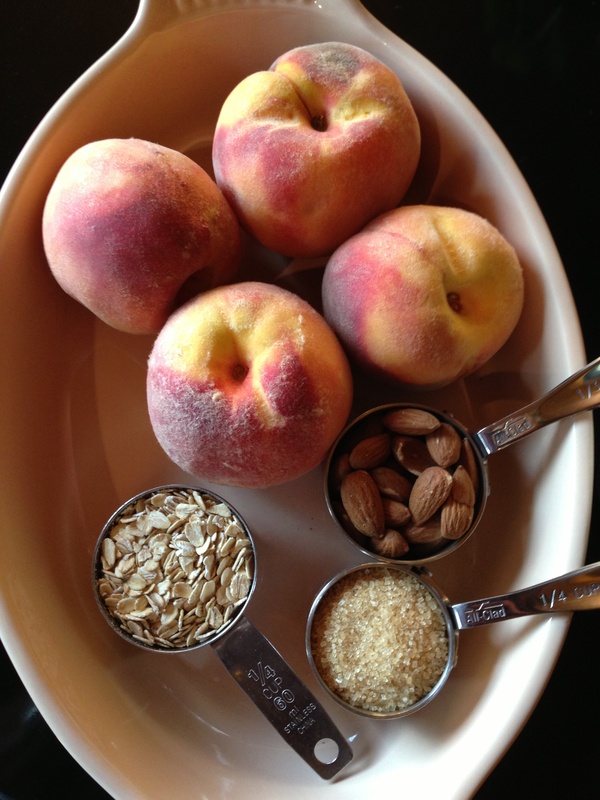 The peaches are in full swing in Utah and they are so delicious! 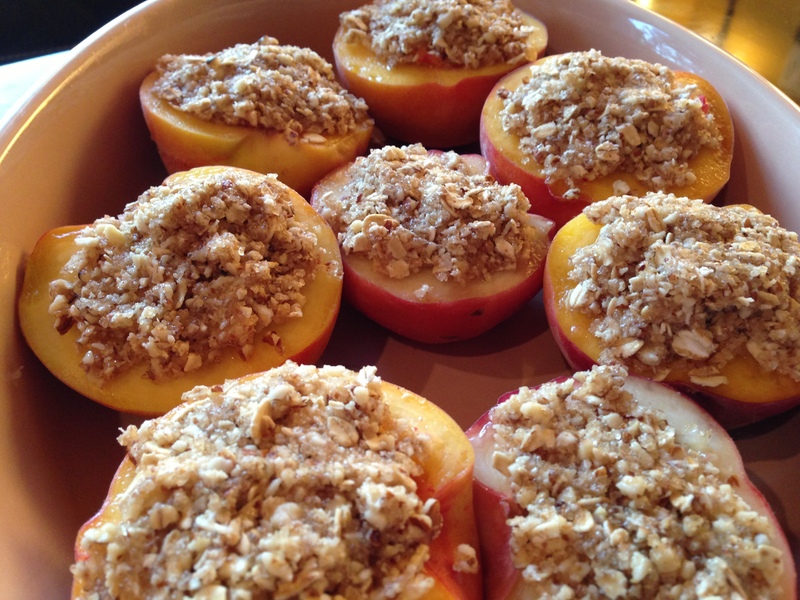 This recipe is a fun and healthy spin on the classic peach crumble or crisp. 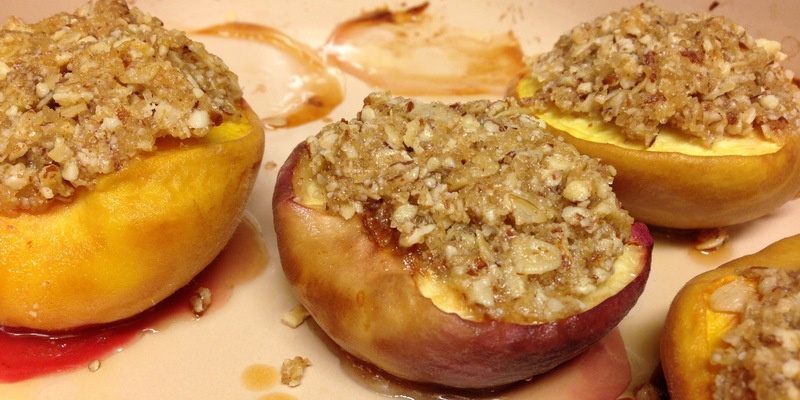 The individual peach halves make a beautiful presentation if you are entertaining. The crunchy almond crisp topping is light enough that it allows the sweetness of the fresh peaches to shine through – so you’re actually enjoying the peach instead of a lot of sugar. Crunchy sweet perfection. Originally, I topped the dessert with ice cream- turns out, it doesn’t need it, they are amazing au natural! And… They are gluten free! Come to think of it a dollop of plain yogurt on these peaches would make a delicious breakfast…drool. This recipe calls for such basic and simple ingredients you’re bound to have some variation on hand at all times- which makes this a perfect last minute sweet treat! Sub peaches for plums, nectarines, apples or pears. Switch up the almonds for your favorite nut- the options are endless! I’ve eaten (and made) many different kinds of peach deserts but this one might be my new favorite and definitely the easiest! Enjoy! 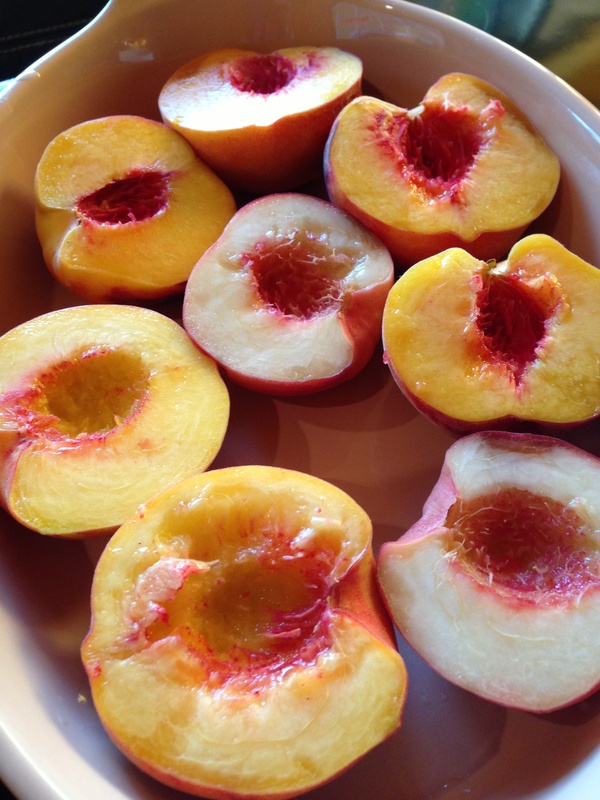 Place peaches cut side up in a baking dish. In a food processor, combine almonds and sugar until coarsely ground (till only a few pebbles remain). Add oats, cinnamon and salt if adding them, and butter, pulsing until they are blended. 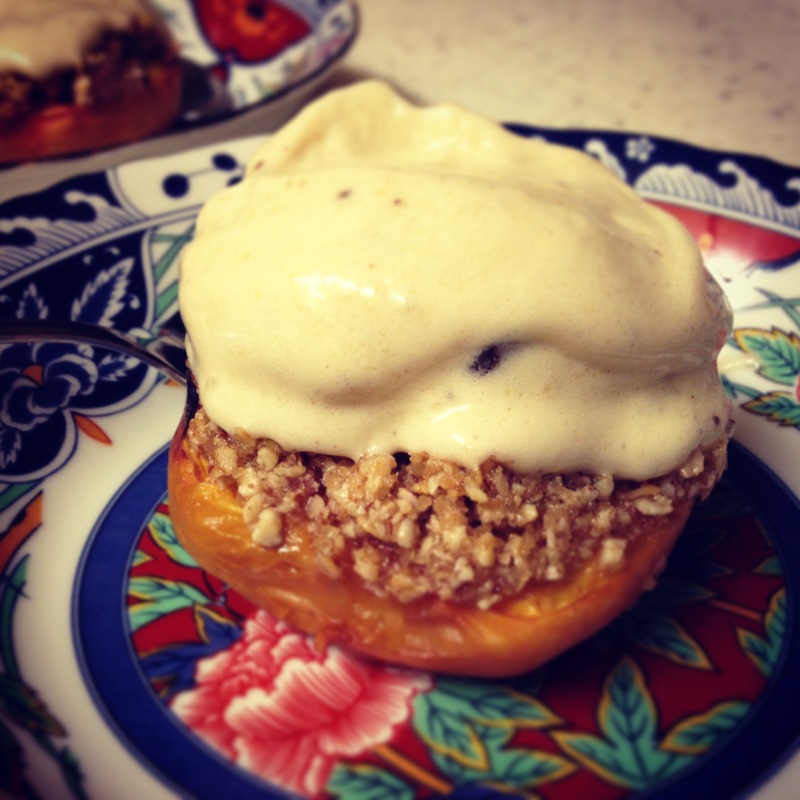 Scoop almond mixture into the center of each peach and press flat to coat the whole top of the peach. Bake for 45 minutes to 1 hour (baking time will depend on peach size) till the top is brown and the fruit is soft enough to cut with fork or spoon. Serve warm with fresh whipped cream, ice cream or with a drizzle of fresh maple syrup. Enjoy! If you don’t have a food processor, use finely chopped almonds and combine them with other dry ingredients. Melt the butter and mix with dry ingredients until thoroughly combined. Scoop mixture into peaches as directed above. This entry was posted in Baked Goods, Desserts, Recipes, Sweets and tagged almond crisp, almonds, Peach crisp, peach dessert by skibootsinthekitchen. Bookmark the permalink. They are irresistible! I’m not kidding when I said I ate them for breakfast and dessert! Enjoy! Those look so cute like that! I love a peach crisp or crispy peach. I made these and they are so easy and absolutely perfect for summer/fall entertaining! 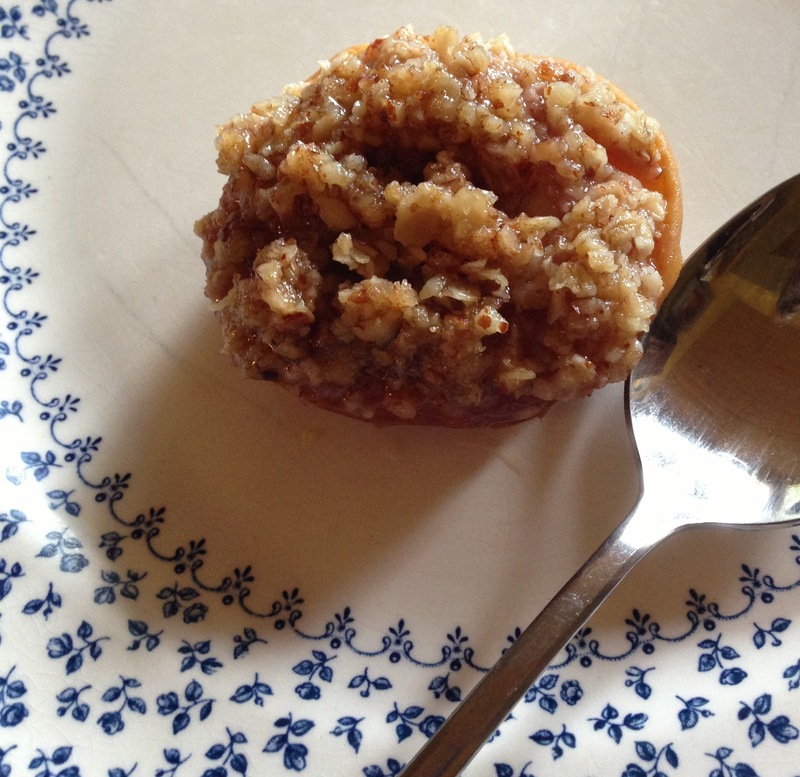 thank you Ski Boots in The Kitchen– my new favorite dessert!